Frank Innes are pleased to welcome to the market this well presented three bedroom semi detached family home in a great central location. The property comprises of entrance porch, open plan lounge diner, fitted kitchen with space for appliances, outbuilding that is currently being used as a utility room. To the first floor initially is the master bedroom with fitted wardrobes, second double bedroom, family bathroom with white three piece suite and finally the third single bedroom. Externally is a rear enclosed garden. 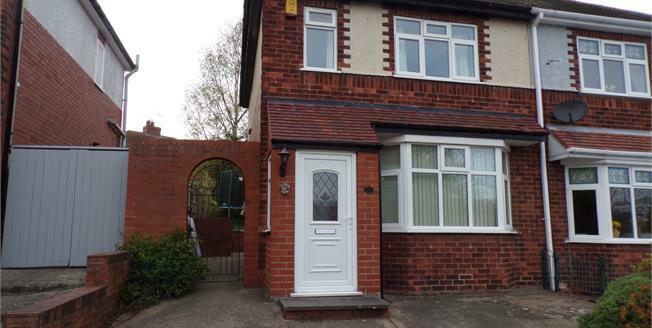 The property benefits from being double glazed throughout, gas central heated and having a driveway to the front. Double glazed uPVC bay window facing the front. Radiator, laminate flooring, ceiling light. Radiator, laminate flooring, ceiling light. Double glazed uPVC window facing the rear. Vinyl flooring, ceiling light. Roll top work surface, wall and base units, single sink, freestanding oven, overhead extractor. Double glazed uPVC window facing the front. Radiator, carpeted flooring, fitted wardrobes, ceiling light. Double glazed uPVC window with obscure glass facing the rear. Radiator, vinyl flooring, ceiling light. Low level WC, panelled bath, shower over bath, pedestal sink.